Some of the best pizza comes from coal-fired ovens. Until I build one in my back yard, we can get the same effect on the grill. We want a crust that's crisp, smoky and slightly charred - my favorite way to have pizza. A few things to keep in mind - the dough needs to be rolled thinly enough that it can cook through on the grill without burning and don't overload your pizza with too much sauce, cheese and other toppings. This dough has two rises so you need to plan ahead. Combine water, sugar and yeast. Proof until mixture turns foamy, about 5 minutes. Mix flours and salt in the bowl of a stand mixer fitted with a dough hook. Add oil to proofed yeast mixture; then pour into flour mixture. Knead dough on low speed 10 minutes. Place dough in a lightly oiled bowl, turning dough to coat surface. Cover dough with plastic wrap. Let rise in a warm place until doubled, about 2 hours. Punch dough down and divide it into four balls. Cover with plastic wrap and let rise another hour. Ok dough is ready, toppings ready to go, you are about 6 minutes away from pizza heaven. Roll out the dough on a dry surface dusted with flour or directly on a pizza peel. Shape into a 10 to 12 inch circle or rectangle - don't worry if it's not perfect, we are making rustic pizza. 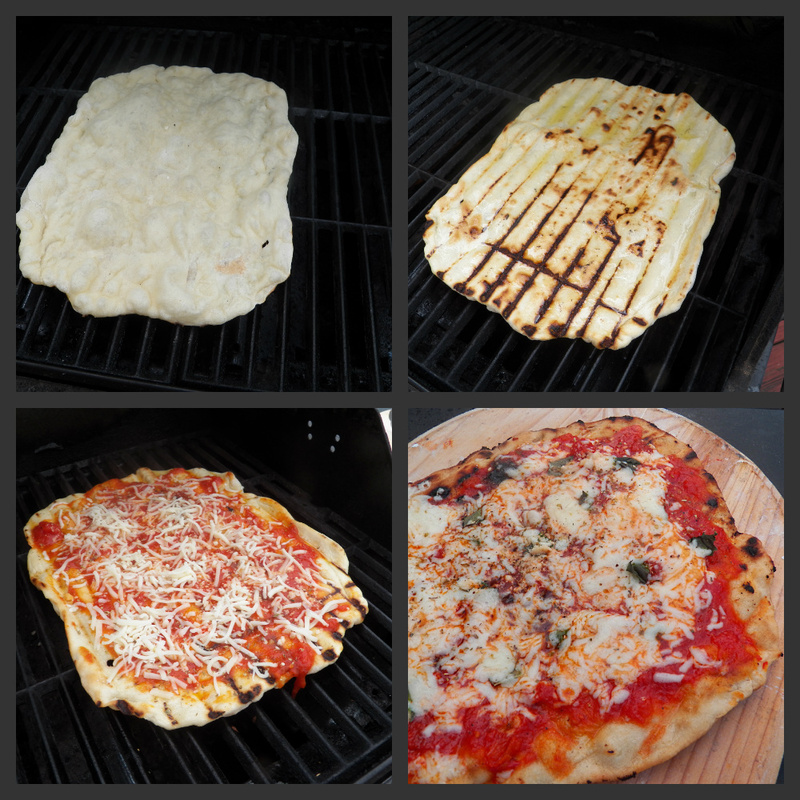 I would use the pizza peel or the back of a baking sheet to transfer the dough to the grill. Warning: Which ever way the dough lands on the grill - that's what you are going to get since the dough firms up immediately from the hot grill. My second pizza was in the shape of a trapazoid I think or maybe the State of New Jersey. Preheat one side of grill to medium-high, the other side to low. Place dough over hot side, close lid, and cook 2-3 minutes. The crust will bubble and grill marks will appear underneath. Use tongs to flip over crust and move it to the cool side of grill. Brush crust with olive oil. Add toppings and keep it light so they cook quickly. Return pizza to hot side of grill for 4-5 minutes. Pizza is done when cheese is melted. Remove pizza using your peel or back of a baking sheet. I made a simple Margherita pizza. 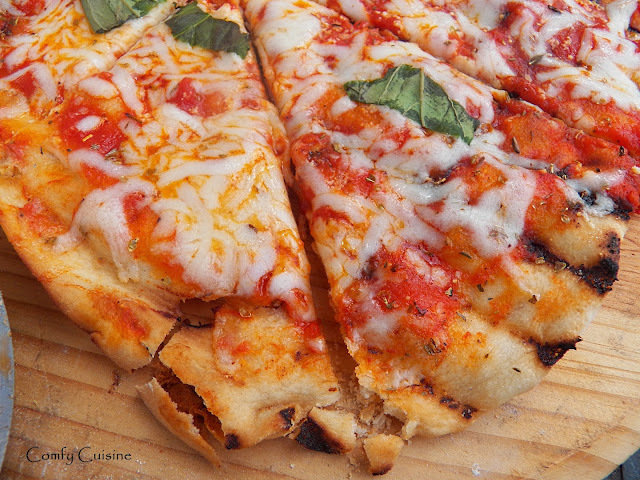 I brushed the dough with garlic-infused oil , marinara sauce, 4-cheese pizza blend and some fresh basil. This makes 4 12-inch pizzas. That was one per person here. *If you don't have cake flour on hand, measure one cup, remove 1 Tablespoon and replace with 1 Tbsp. of cornstarch. My Mr. Rosemary is one very particular pizza lover. I'm going to make this for us -- I fear I may have to grill otside all winter, though! It's so worth it Rosemary! I made this in the middle of winter - that's how much we crave this! Oh I can't wait to try this! We love pizza on the grill. Usually I just use premade crusts when cooking on the grill, but this sounds much better. I would use just 1 teaspoon of table salt Barbara. Let me know if you make it! I have made pizza dough from scratch but I have never grilled pizza...yet. Now you have me inspired to do so. This is wonderful! It is great for the summer when you dont want to use the oven and heat up the house. I bookmarked this for later. Thanks for sharing. What an amazing idea! Just lovely. Thanks so much for linking up at Weekend Potluck...please come again soon. Can the dough be frozen? It is just two of us and I probably wouldn't want to use all that.